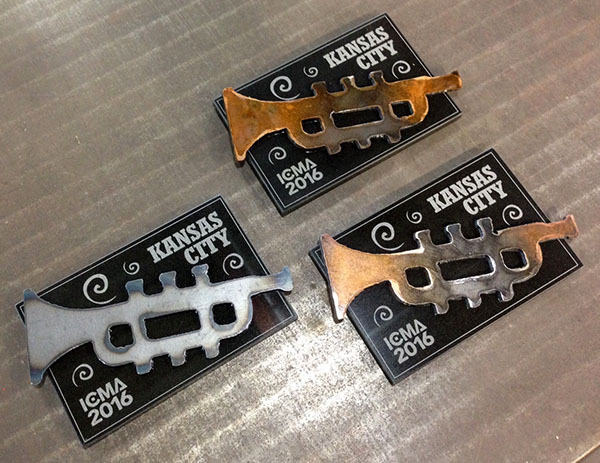 I was asked to create a special gift to give to prospective attendees of next year's ICMA convention, here in Kansas City. The ICMA is the International City/County Management Association. 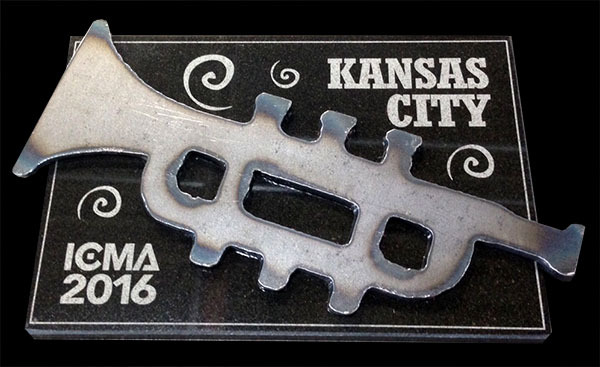 Using elements of the convention logo, I cut out steel trumpets that reflect the city's jazz heritage. Next, I had granite tiles laser engraved. Each gift has a different finish. Some are left as raw steel, showing the burn marks from the cutting. Others have a copper plate or a copper rust patina. I used a torch to add color to some of the gifts. Each gift is approx. 6 inches wide by 4 inches tall. I packaged them in low profile boxes for easy shipping.